Columbus Day is right around the corner, and as regular readers know, that’s the occasion each year for us to feature a classic Italian-American dish. This year we’re sharing an old family recipe, one that I’m sure will be familiar to many readers “of a certain age”: Peas and Eggs. A quick and inexpensive dish that recalls simpler—and leaner—times. Remember Clara Cannucciari’s Great Depression Cooking YouTube series, in which her grandson lovingly recorded the 90-plus-year-old Clara preparing the simple and inexpensive meals that had got the family through the hardships of that era? This is that kind of cooking. The original Old World version of this dish, piselli cacio e uova, is a delight, but today we’re going to talk about the New World version. For once, the trip across the ocean did not make the dish more complicated or carnivorous—just the opposite, in fact—but one thing marks Peas and Eggs as Italian-American: the use of a humble convenience food, canned peas. Foodies often turn up their noses at canned products, but they have their place, I think, in home cooking, particularly when it comes to legumes. And peas were among the first foods to be canned. In 1806 the legendary gastronomist Grimod de la Reynière wrote glowingly of the new-fangled product, noting that canned peas were “green, tender and more flavorful than those eaten at the height of the season.” I wouldn’t quite go that far, but Peas and Eggs, along with its close cousin, pasta e piselli, just wouldn’t taste quite right to me made any other way. In a large braiser or saucepan, sauté the chopped onions gently in olive oil until they are very soft and translucent, taking care that they don’t brown. While the onions are braising, season them lightly with salt and pepper, and add a few drops of water from time to time—this will help them soften and prevents browning. Take your time, as the flavor of the dish depends in large part on coaxing the sweetness out of this soffritto of gently sautéed onions. Pour the canned peas, together with its liquid, into the pot. Let them simmer gently for just a few minutes, to allow the flavors to meld. While the peas are simmering, whisk the eggs together with the grated cheese and, if using, the parsley, in a mixing bowl. Season generously with salt and pepper. Turn up the heat a bit and add the egg mixture to the peas. Mix together with a wooden spoon or spatula until the eggs have formed soft curds and remove from the heat. The eggs will absorb the liquid the longer it cooks—you can let it cook longer for a ‘dry’ version, shorter for a ‘wet’ one, as you prefer. Serve immediately, with some extra cheese sprinkled on top if you like, and perhaps a nice turn or two of freshly ground pepper. The Old World version of Peas and Eggs, piselli cacio e uova, calls for fresh or frozen peas instead of canned; instead of the canning liquid, some homemade broth is added to the peas as they simmer. Fresh peas will take a bit longer to cook than canned or frozen. 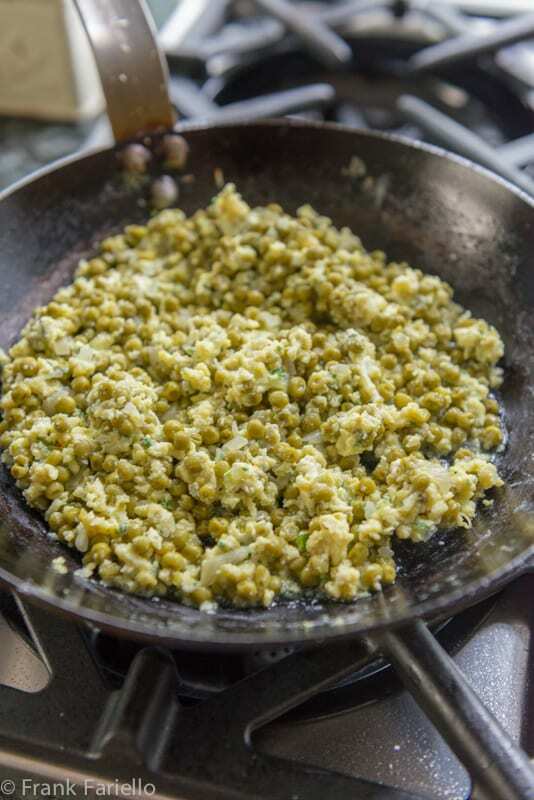 The Tuscans add some pancetta to the soffritto, and rather than being scrambled, the eggs are gently opened and placed whole on top of the simmering peas to poach—very much like Eggs Florentine. As mentioned, you can makes your Peas and Eggs dry or wet. And if you add broth to your Peas and Eggs, it turns itself into a rather nice soup as well. You might even go crazy and take it in another direction, adding ditalini or another smaller pasta shape, which makes for a fine pasta dish, a slightly richer version of pasta e piselli. Peas and Eggs is a real poor man’s meal, but it really does taste better if you use those slightly more expensive, very young smaller peas, which are sweeter and more delicate in taste. And if you’re concerned about the BPA in canned products, some companies now use BPA-free cans, and others sell peas in jars. Peas and Eggs is a hard dish to categorize. It could be a first course, especially if you make it on the soupy side, or a vegetarian second course, or even a side dish if you go easy on the egg. But to my mind, Peas and Eggs is interesting enough to be its own light dinner—a piatto unico, as they call it in Italian—served with a nice chunk of crusty bread and followed by a piece of fruit and perhaps a nice bit of aged cheese. Finally, a special thanks to my Mom for sharing Angelina’s old recipe, which she still makes from time to time. Without her good memory, so many of these family recipes would have been lost by now! In a large braiser or saucepan, sauté the chopped onions gently in olive oil until they are very soft and translucent, taking care that they don't brown. While the onions are braising, season them lightly with salt and pepper, and add a few drops of water from time to time—this will help them soften and prevents browning. Pour the peas, together with its liquid, into the pot. Let them simmer gently for just a few minutes, to allow the flavors to meld. Turn up the heat a bit and add the egg mixture to the peas. Mix together with a wooden spoon or spatula until the eggs have formed soft curds and remove from the heat. Serve immediate, with some extra cheese sprinkled on top if you like, and perhaps a nice turn or two of freshly ground pepper. Very true, Theresa. Next time I may try this with potatoes. Thanks for the suggestion! My great grandmother used to make this for me as a child. It’s a freezing day here in NYC and this dish sprang to my mind for some reason. I haven’t had it in over 20 years. My mother couldn’t recall it at all so I searched the internet but none of the recipes sounded quite right until I hit this one. Thank you so much for posting it. We lose a lot of our traditional food over the years and I’m so happy I can replicate this dish Nana always made me. That’s fantastic, Alyssa. I love it when I can help people find old family recipes. Thanks for your message! Learned about yet another dish: both the Old World and New Vorld version! You’re welcome. 😉 And thanks for stopping by! Nice! I also have not had the pleasure to taste this dish. My mother had a small set of recipes for preparing peas and this was not one. Alas, since given my love for eggs, I think it may have been quite appealing and shortened my pea-disliking phase (which lasted until I was a teenager). I will definitely try making it. P.S. I recently made and posted about Ecuadorian mote pillo and there are interesting similarities between the two dishes. The similarity is intriguing, Simona. I guess there’s nothing truly new under the sun, just variations on old themes! Wonderful. Prepared it with fresh peas and a bit of Verdicchio. Will add some panchetta next time. Thanks for sharing this recipe and your personal memories Frank. I never recall either of my grandmothers preparing this dish, but it seems like something they would have served their respective families. Frank, this is a combo I do not know, but it is sounds great. My mom and grandmother used to make all sorts of “… and egg” dishes, but they missed this one. I can’t imagine why because my mother’s absolute favorite canned item (we are talking the fifties here) was canned “petit pois.” Boy, but those tiny tender peas made an appearance on many a dinner table and were a part of absolutely every Thanksgiving and Christmas feast. Thanks fro sharing your memories, and thanks to your mom and Angelina also. I guess those canned peas were part of many of our families, Adri! Somehow, I have never heard of this combination. I’ve made zucchini with eggs and cheese. And agnello cacio e ‘ova is a classic Abruzzese dish. I don’t know if I can do the canned peas, though…Might have to substitute frozen! Ah, yes, well no doubt frozen or fresh peas would produce a finer dish. But for me, you know how it is: once a taste memory gets imprinted in you mind, there’s no changing it. nonostante abbia ormai una certa età questa ricetta non l’ho mai assaggiata, adesso non ho scuse devo farla al più presto Frank ! Buon weekend ! Grazie, Chiara! Fammi sapere se ti piace e buon weekend anche a te! For years I only knew peas of the canned variety. When we first came to this country that is all that was available. Mamma would make this recipe and she always cooked her vegetables for a long time. Crunch did not exist in our household. My papa would not eat broccoli unless it was well cooked — the same went for everything else. Mamma was an excellent cook and everything she made was delicious. Your recipes bring back such sweet memories. Grazie!! Glad I could bring back those fond memories, Marisa. It’s true about the old fashioned way with vegetables. And I actually think that we can learn from those old ways. Like broccoli—I agree with your papa that it tastes much better when it’s well cooked! And I remain grateful for your readership, James! I will have to try the Sephardi version next time, it sounds lovely. Nana would be proud of your memories. I share them.